This piece proves that silver and gold can and should be worn together! It measures 20" clasp to clasp with another 4" added by the center dangle. 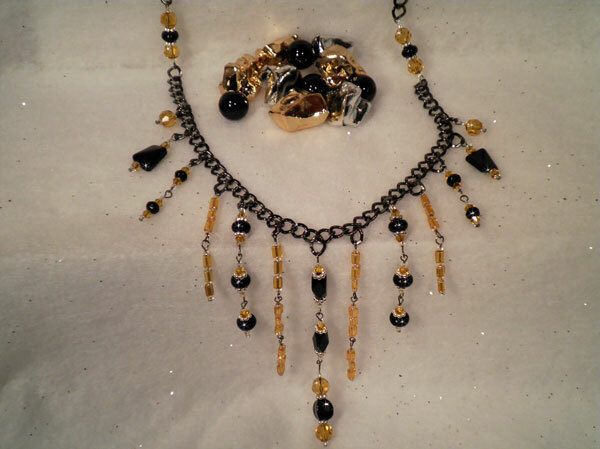 I've used a wide variety of black and gold beads on a sparkling charcoal chain with silver spacers and silver seeds thrown in for fun. In black, I've used large rondelles, smaller faceted rondelles, twisted rectangles, faceted tubes and a twisted coin. In gold, it's got fully faceted glass rounds, bicones, tubes and seeds. This special occasion piece has much more sparkle and movement than any picture can capture.